Do you want your kids to have "normal" kid-type foods but yet you don't want them to eat artificial dyes? I know I do! I found Edward & Sons, Inc., "Let's Do... Sprinklez" and they're USDA Organic (also Vegan). I picked up the chocolate and confetti kind. They are going to be super fun to eat on ice cream and baked goodies. I made oven fried zucchini. I served the zucchini with a side of whole wheat rotini and tomato sauce. The zucchini sticks weren't fully breaded upon completion, they still tasted great! But I'm a bit bias because I love zucchini!!! Recipe is inspired by Bridget Swinney. 1. Preheat oven to 450°F. Spray baking sheet with cooking spray. 2. Place bread crumbs, oregano, basil, cheese, and garlic powder in a Ziploc bag and shake well to combine all ingredients. Set aside. 3. Cut each zucchini in half horizontally. Then cut each half lengthwise into 8 pieces. Fill a small dish with milk. Dip each zucchini stick in water or milk, then drop into crumb mixture. Shake until zucchini stick is coated on all sides. Place on cookie sheet. Repeat with rest of sticks. 4. Bake on cookie sheet for 10 to 15 minutes or until brown and tender. Serve with warm spaghetti sauce and pasta. A very small percentage of people get everything they need from eating healthy, whole foods in which most vitamins can be consumed from naturally occurring sources. I am thankful that my family receives a good portion of their naturally occurring vitamins from fruits, veggies and grains. I really enjoy vegetables so sometimes getting fruits in is best done through a smoothie. My son on the other hand really likes fruits though he does love carrots, broccoli, along with kale, spinach, and zucchini. We keep a good selection of fruits and vegetables on hand. He's learned to love tomatoes last month which made me pretty darn excited. For his age, he will try anything at least once but typically he will try it again and again until he determines he likes it. I never give up on offering him anything because one day he may want it, like it and ask for it. For the portion of vitamins we don't get from our whole foods, we eat a whole foods supplement. We also take other types of supplements that have benefits specifically to digestion health. Every day my son eats one acidophilus (probiotics) chewable, two vitamin C chewables, 10 drops of ALJ herbal extract and his whole foods gummies made of 17 fruits, veggies and grains. I take the same whole foods product in capsule form, ALJ herbal extract in capsule form, and sometimes (especially during cold season) two vitamin C chewables. We make smoothies throughout the year and we add local raw honey to help combat allergies to pollen, flax seed meal (omega 3s, positive effect on cholesterol), milk thistle (20-40 drops, protects the liver and an awesome detoxifier among other benefits), and a protein powder by the same company that makes the whole foods supplement. What products do you eat to bridge the gap? Last month I offered my 2.5 year old son eggplant parmesan with tomato sauce and he tried some and said mmm mmm as he was chewing. Of course when I eat anything that I want him to try I make a big deal out of how good it is while I chew too. So for the next 3 days I offered him the spaghetti. Only on the first day did he eat the eggplant. I offered it to him but he refused. I was okay with that because like the tomatoes he will eventually like eggplant too. How we got here took over 3 years in the making. I've been a huge fan of tomatoes since forever. I really craved them during pregnancy and probably cooked a dish nearly every night for dinner that incorporated tomatoes. Over the next 2 years, as with anything else I want him to experience, I offered tomatoes over and over and over again. Nothing. He didn't want anything to do with it. So never give up on your kids. They say it typically takes about 15 exposures before your kids may show interest. With tomatoes, it has taken much longer. Though I do have a secret to share. My son did not know that the gummies he eats that includes 17 fruits, veggies and grains includes TOMATOES!! So these 3 years of eating tomatoes, he finally likes it. This should tell you perseverance trumps all (and of course, a lot of patience). So the other day I was at my local health foods store and one of the workers always puts on a food demonstration or features a food product from the store that week, usually whatever is on sale. I walked in and beelined to her because I wanted to know what was featured plus my stomach was growling. She was serving strawberries and pineapple. I said I would love to buy pineapple fresh but I don't know how to cut the skin off. She showed me. Wow, so simple! First you see if the fruit is ripened. The way you can tell is if it has yellow in the vines of the skin. If it's green, it's not sweet yet. If it's part yellow then it's half sweetened. Let it sit on the counter until it turns yellow. Don't wait too long though because it can spoil quickly. Once it's ripe, you pull off the top with your hand. Then you cut off the top and the bottom. Cut the pineapple in half. Then you'll cut a "V" into the middle of each half to remove the stemmy core. Then you slice it like you do with cantaloupe to remove the melon from the rind. Serve. Voila! The pineapples were on sale for 97 cents each! The pineapple I picked out was partial green and yellow. One day later, it was nearly all yellow. I cut into it the way I learned how and it was so easy! The fruit is perfectly sweetened. I got a bunch of fruit for the little pineapple I had chosen! I am sure I'll be buying more from now on! 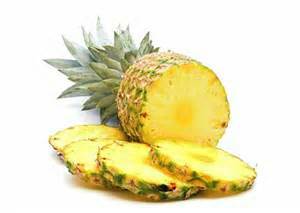 I've always chosen pineapple for their natural anti-inflammatory benefits. They are also high in vitamins and have digestive benefits. They are mega immune supporters, mainly vitamin C. They offer antioxidant defenses. Benefits of pineapples. Have you eaten any pineapple this week?